*Metta is unconditional love. Kindness. A powerful feeling of wishing well towards yourself and others. **Maha: In Indian, Maha can refer to "great." My friend and I went to our favorite Thai vegetarian restaurant the other day. It's located in a strip mall with the bay right across the road. When you walk into the space it feels tranquil; the understated decorations support the vibration of peace. We have eaten there several times now and are recognized by the people who work there; we feel pampered by them. The food served there is not only flavorful to the palate but also beautifully presented, a gift for the eyes. 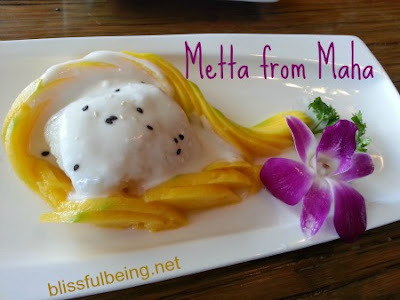 One of my favorite desserts is the Mango Sticky Rice which is presented in the form of a fish (as shown in the image for this blog post.) There is care to detail and taste, and I feel nurtured after eating this food. On this particular visit, as we were served our food the waiter told us the chef gave us large portions because he overheard me say how hungry I was, having just come in from teaching a yoga class. We were finishing our lunch when the chef came out from the kitchen to see how we liked what we ordered, which we found to be delicious. He looked much younger than his stated age, which is somewhere in his forties as I recall. He introduced himself as Maha, and as we began conversing I was surprised to learn he had been a Buddhist monk for 17 years starting at the age of 7. When he disrobed (the terminology for leaving the monastery) he had no skills to earn a living, so he learned how to cook. He knew he wanted to see the United States and has travelled around, even living in Florida for several years. He told us how while in the kitchen he sometimes meditates as he is preparing and cooking to help keep himself calm and centered. It occurred to me that perhaps his meditations infused the food with unconditional love, kindness; that it contained feelings of well wishes that nurtured my soul as well as my belly; that the food we were served was filled with metta and that is why we found it so satisfying. Since that meal, I have consciously tried to fill my classes with metta; to create an environment in which my students experience unconditional love and kindness; a powerful feeling of wishing well towards myself and others. May I have the privilege of your presence as we practice yoga together. You can do this easy meditation technique as you read the instructions below. It should take no more than 15 minutes. Sit comfortably upright but not rigid in your chair- away from the backrest if you can. You need to be close enough to the computer screen so you can easily read. Next picture someone you feel neutral about. Now someone you dislike. But not too much! Now just sit and be still for a few minutes. Rest in any feelings of loving-kindness that you feel. Then just allow yourself to feel little gratitude. No need to force it. Allow that feeling of gratitude to expand...... to slowly fill up your whole body....the whole room....the county.....the world...the universe.